The Geothermal Energy Association’s 2016 annual production report said the U.S. had about 2.7 gigawatts of net geothermal capacity at the end of 2015. In addition, the U.S. market was developing about 1.25 gigawatts of geothermal power, and new renewable portfolio standards in states such as California and Hawaii could create opportunities for geothermal energy, the report said. Su said the high temperature hammer could help reach those development goals. Su considers the three-year project a success, and said the team and Atlas Copco are looking for opportunities to deploy the tool. A critical piece of the project was developing lubricious coatings, which help reduce friction between parts, important in geothermal operations. “As temperatures increase, the oils essentially cook and you get this sooty mess inside. It’s like running your car too long without changing your oil,” Su said. The hammer has internal moving components that require lubrication, similar to a piston in a car engine. His team’s work on materials and lubricious coatings built on decades of Sandia research in those areas. The team worked with Sandia’s Materials Science and Engineering Center on a multilayer solid lubricant capable of operating at high temperatures. Similar solid lubricants are used commercially, for example, to improve the lifespan of moving components in cars, but Su’s team worked with a formula tailored to the operating conditions and base materials. The project began by determining whether a high-temperature hammer was even possible. The Sandia team initially tested materials and coating combinations that would survive the expected environments while Atlas Copco designed a hammer without plastic parts, Su said. They proved the concept, and the project spent the next two years building hammers and a facility for high-temperature testing. The hammers proved successful. “We were able to reach our drilling rates, the materials held up, the coatings worked well,” Su said. Sandia’s new facility is designed to test hammers under real-world operating conditions, including temperatures up to 572 degrees Fahrenheit (300 degrees C). Conventional drilling generally sees temperatures of less than 320 degrees F (160 degrees C). 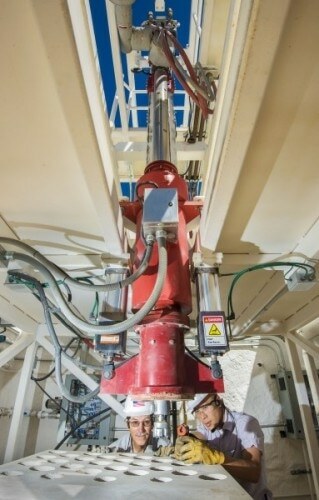 The high operating temperature (HOT) test facility, a three-sided open concrete structure, houses a 20-foot-tall drill rig, heating chamber and process gas heater. Researchers can simulate conditions deep underground and the elevated temperatures affecting the hammer and can drill into different types of rock, like the granite commonly found in geothermal-rich areas. The facility is instrumented to measure drilling parameters. HOT was in itself a large project. “We took a little more time in the development process, but when we put it all together, everything worked pretty much as we expected it to,” Su said. The work required integrating multiple subsystems, including electrical, mechanical, pneumatic and control systems. Sandia also worked with Atlas Copco on what instrumentation was required to collect the necessary data.